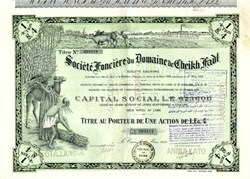 Beautiful certificate from the Société Foncière du Domaine de Cheikh Fadl issued in 1938. This historic document was printed by the Litho. Flli. 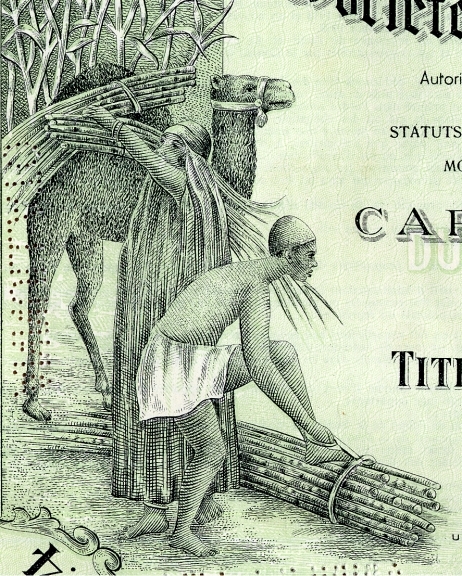 Ventura, Alexandria, Egypt, and has an ornate border around it with two vignettes of a man working with oxen in a field beside a river, and a man and woman bundling wood with the help of a camel. This item has been hand signed by the Company’s Administrators, and is over 73 years old.